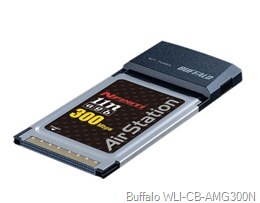 The Wireless-N Nfiniti Dual Band Notebook Adapter from Buffalo is designed to draft IEEE802.11n standard 1.0 specifications to deliver ultimate connectivity for your wireless world. This notebook adapter truly allows you to connect to any type of wireless network. No matter if it is Draft 802.11n, 802.11g/b or 802.11a, this Dual Band adapter will connect. When connected to a Buffalo Nfinity router this CardBus adapter will provide blazing fast connection speeds of up to 300 Mbps. And, support for Buffalo's AirStation One-Touch Secure System™ (AOSS™) and a variety of security protocols make it a safe choice as well.